The HEAT Beat the MAVS 105 to 94 in a Christmas Day Massacre that left the majority of Dallas fans pouring out of the Arena before we even put our BACKUPS in! The final score doesn’t do this game justice UNTIL you realize LeBron and Wade were sitting for most of the 4th Quarter! 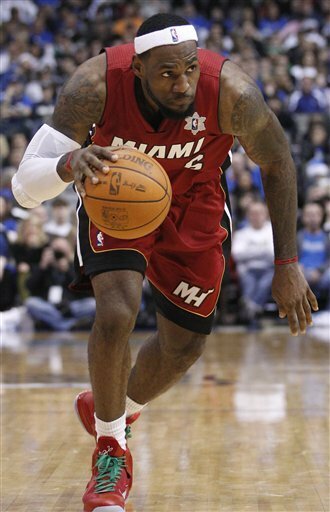 Congrats to LeBron James for being voted the DHM FAN Player of The Game! The first night of the season and the HEAT are already putting out highlight reels! Now that the Mavericks are out of the way – are you READY to take on the Boston Celtics? Can’t make it to the AAA? Watch the HEAT beat the Boston Celtics with DHM and ALL of your friends at The S Bar! 10% OFF your bill if you rock a DONT HATE T! Previous article Dwyane Wade Jordan Fly Wade 2 Miami Launch! Dwyane Wade Jordan Fly Wade 2 Miami Launch!